30000: The system cannot find the path specified. 2015-08-25 21:06:31 WARN: 30000: Failed to get information for file '\\?\STC_SnapShot_Volume_21_5\VolumeImages\C_VOL-b001-i017-cd-cm.spi.bitmap': The system cannot find the path specified. STC stand for the Shadowprotect Snapshot Driver. The Axcient cloud backup was working properly but Shadowprotect then simultaneously began a pre-scheduled backup. The ShadowProtect backup deleted the current snapshot when it created one of its own and, in doing so, deleted the snapshot which the Axcient cloud backup was previously using. 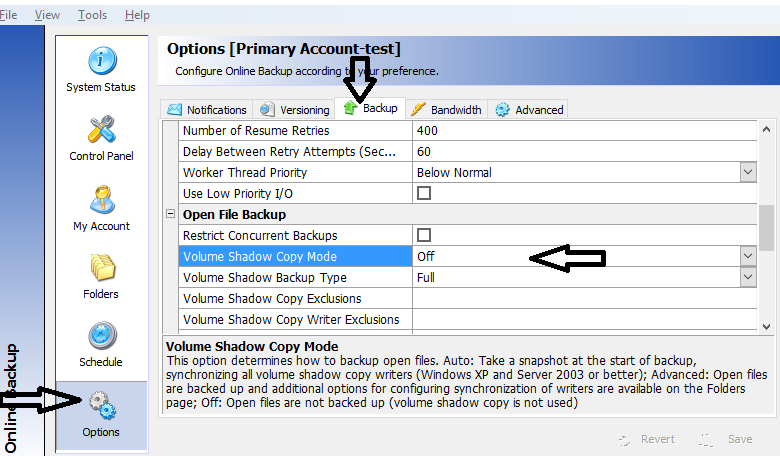 First, turn off the VSS snapshots in the Axcient Backup Manager. Do this by clicking Options > Backup and then scrolling down to Volume Shadow Copy Mode. Change this setting to Off. If that does not work, adjust the backup schedules. Allow ample time for the Axcient cloud backup to finish before the scheduled Shadowprotect backup begins.